If your in the need of Dog Food - here's a great deal worth checking out at Target! Starting Today, August 10th, you can score $10 off a $40 or more Dog or Cat Food, Litter or Treats Purchase when you use the Target mobile coupon! 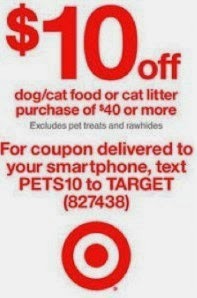 Just text PETS to 827438 or this coupon will also be available in the Target Sunday ad. You can also use this promotion for pet care purchases on Target.com when you enter the code PETS10 at checkout. Stay tuned for some deals! Take 30% off your purchase at Old Navy today only (8/10) with code SAVEMORE. Restrictions apply. I love the Skinny Jeans for Baby on sale for $14.00 (Retail $19.94) &amp; now only $9.80 after code: SAVEMORE. New Coupons: Irish Spring, Degree MotionSense, Beneful Pet Food + More! Today ONLY, the first 22 books in the Dark-Hunter series by Sherrilyn Kenyon are only $2.99 each on Kindle.